Good heavens, the holidays are nearly here! Where did the year go? I feel like I just took down my Christmas decorations, and now they need to go back up. I’m really not ready for it this year. Rather than ‘ho ho ho’, I feel ‘ho ho ho-hum’. Some years I get filled with the holiday spirit weeks in advance of Thanksgiving. This year, I am feeling a little like the Grinch! The best cure for the holiday grumpies is baking. I have most of my cookies baked (and stay tuned, because one of the cookies I baked is also a new recipe that will show up here next week! ), and I am going to get that damn tree up this week. I am. Them maybe I will have a little more jingle in my step! 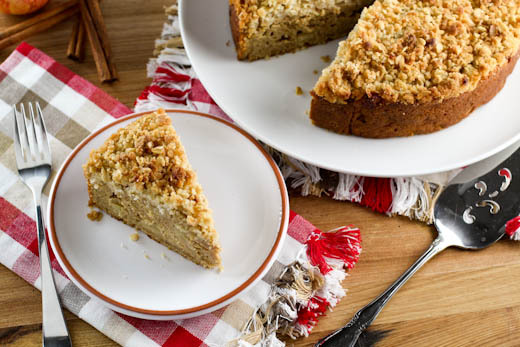 So, in the spirit of giving – which I also need to get into – I present a lovely coffee cake that you could give to family, friends, co-workers, or even serve for breakfast after Santa has finished his rounds. Most people expect pumpkin cakes around this time of year, so I switched things up and went with sweet potato. 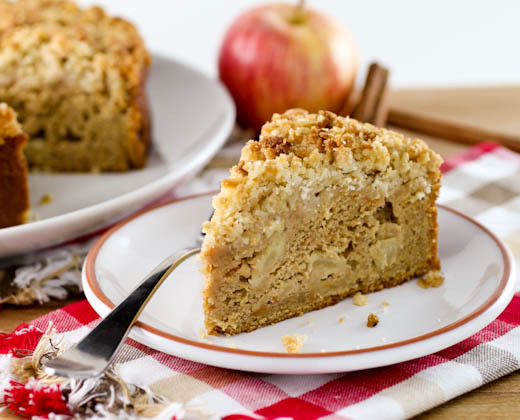 It makes this cake incredibly moist and rich, and it stays that way for a few days if stored in an air-tight container in the fridge. You can make this cake up the night before you plan to serve it, then just bake it before your guests arrive, or before your family gets out of bed. The scent just screams holiday cheer! 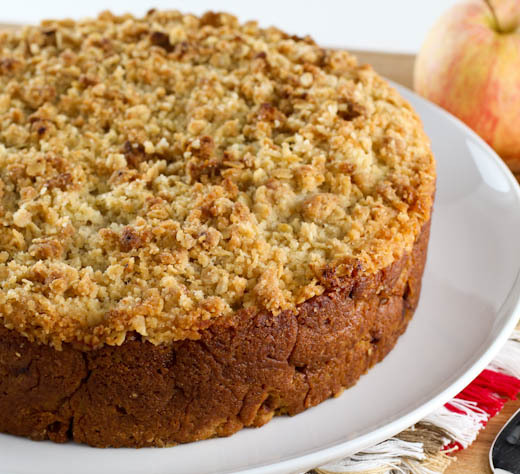 This would also make a great dessert for the holidays or Thanksgiving. If you like things nutty, a cup of finely chopped pecans or walnuts would be a lovely addition. Add 2/3 to the batter and the rest to the topping! In a medium bowl combine the flour, baking powder, salt, cinnamon, allspice, ground ginger, and nutmeg. 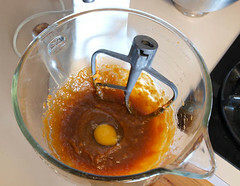 Whisk the mixture to combine and set aside. 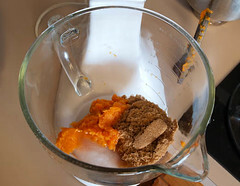 In the work bowl of a stand mixer fitted with the paddle attachment, or in a large bowl with a hand mixer, combine the sweet potato puree, brown sugar, and coconut oil. Mix on low speed for 30 seconds to mix, then increase the speed to medium and beat the mixture for 1 minute. Add the egg and beat for 30 seconds more. Stir the vanilla into the buttermilk. 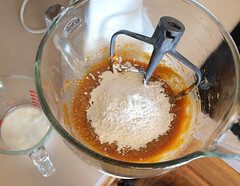 Add the mixed dry ingredients in three additions alternately with the buttermilk to the sweet potato mixture starting and ending with the flour. Do not over-mix. 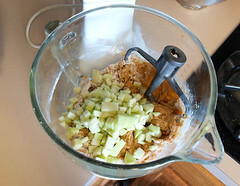 Add ⅔ of the diced apples and fold to combine. 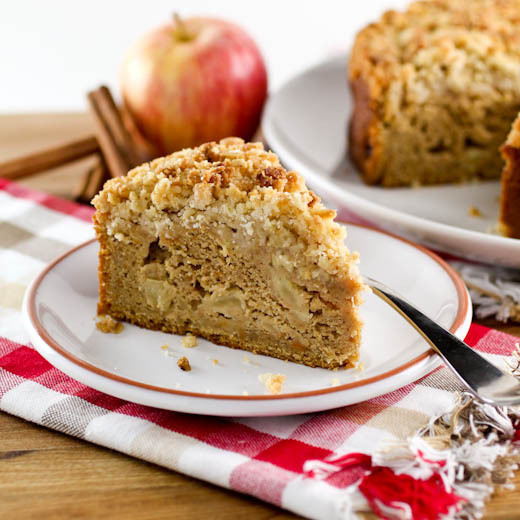 Spread the batter into the prepared pan and sprinkle the remaining apples over the top. Set aside while you prepare the topping. 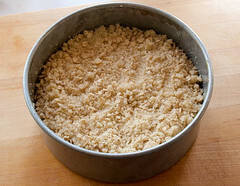 In a small bowl combine the flour, sugar, and oats until well mixed. 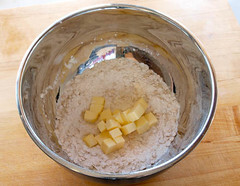 Add the butter, and with your fingers, rub until the mixture looks like coarse sand. 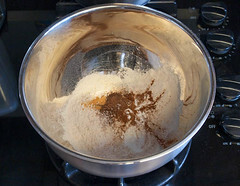 Spread this mixture evenly over the cake then bake for 40 to 50 minutes, or until the sides of the cake just come away from the sides of the pan and a wooden skewer inserted into the center of the cake comes out clean, save for a few damp crumbs. Cool in the pan for 20 minutes before turning out onto a plate, then turning again onto a wire rack to cool to room temperature.